Inshore Sport fishing with Come Fish Panama for a full day the 3rd week of November was Robert, Rob Jr. and Aaron from Houston, Texas. 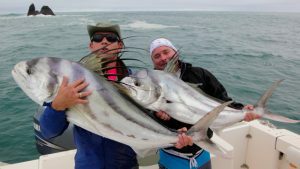 These anglers came looking to hook up with Roosterfish which was their main goal so we did not want to head to far offshore during the day. I did mention to them that the Dorado’s have been luring in and around our waters during the past few weeks just past the inshore beak. Throughout the day we encountered rain or light rain showers that did not let up until the last 2 hours of sport fishing. The seas continue to provide lots of floating debris which is great for Dorado fishing as many know. Water temperature is on the cooler side with the November rains. for about an hour on Wahoo but no Wahoo to be found either. We finally decided to Roosterfish around the many rocks where the Rooster like to hang. After a bit the line started to peel out and we gave the rooster enough line and bang he was on. Within a few seconds another Rooster took off with the second live bait we had out and a double rooster slam was provided. Rob and Aaron fought these species as a double rooster slam needed to be fought. Finally with both roosters on deck we quickly took pictures to provided a safe and healthy release on our double rooster slam for these anglers. Come Fish Panama once again would like to thank these Texas anglers for providing us an opportunity to take them inshore sport fishing here in Panama. 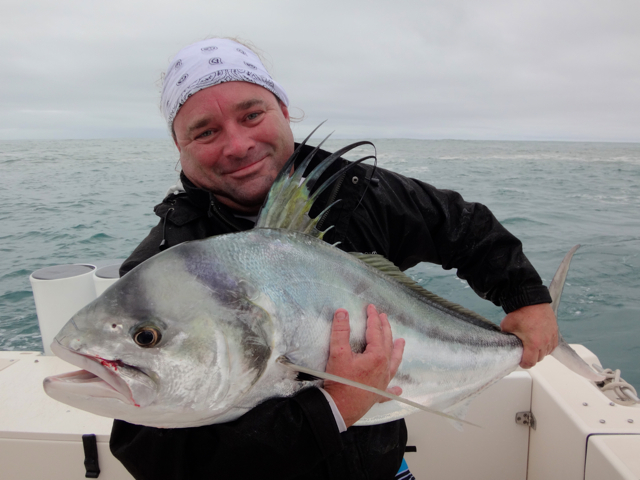 We recognize that there are other fishing charter providers out there and are grateful these anglers chose us. We look forward to having them back in June 2016 for the Yellowfin Tuna Slam.